1995 was a revolutionary year on a worldwide scale for a number of reasons. Proceedings in the OJ Simpson case got underway (Ironically, he was voted to be released on bail yesterday), Windows 95 was released, eBay was founded, the Sony PlayStation was released, and South Africa famously won the rugby world cup. In terms of music it was also a landmark year, with pop hits like ‘This is how we do it’, ‘Boombastic’ and more all taking over the charts, while the timeless ‘Insomnia’ by Faithless made its entrance into the world. 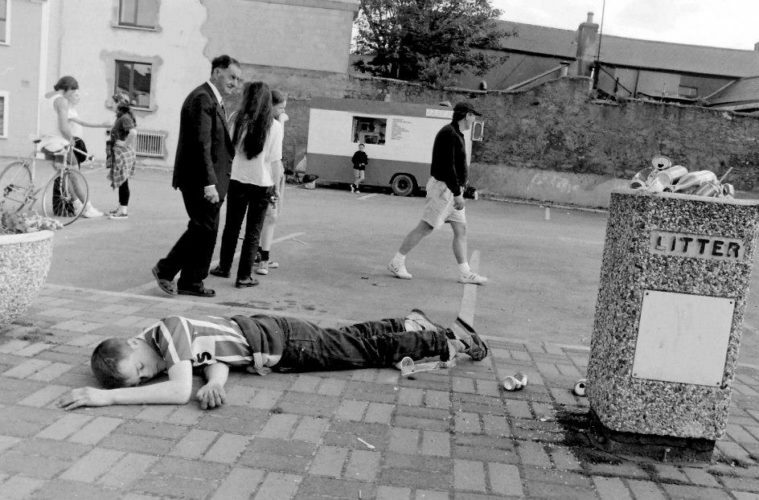 A poster from 1995 Cork festival, Féile, has been doing the rounds online lately. Due to its outrageously stacked lineup, cheap price and overall simplicity, people are questioning how exactly this came to place whereas now there’s a festival almost every second week. Thankfully, it’s 2017, and the internet is a full blown entity in itself so obviously there are nuggets of Féile ’95 floating around YouTube, including this peculiarly U2-themed highlight video from the Cork gathering. It’s important to point out that this lineup is indeed possibly one of the most impressive you’ll see in a long time, but plenty of these acts were yet to release some of their best work, hence why the Chemical Brothers are so low down on the lineup(!?). With that being said, The Prodigy coming off the back of their turbo-powered debut ‘Experience’ is definitely something us at Four Four would pay top dollar to see, even if it involved trekking all the way to Páirc Uí Chaoimh. If you look even closer you’ll see Laurent Garnier and Carl Cox, with Dave Clarke in even finer print joining the Chemical Brothers on the left hand side of the page. Massive attack’s soundsystem headlines ‘The Groove Stage’, with their main man Tricky making up part of the main stage lineup. 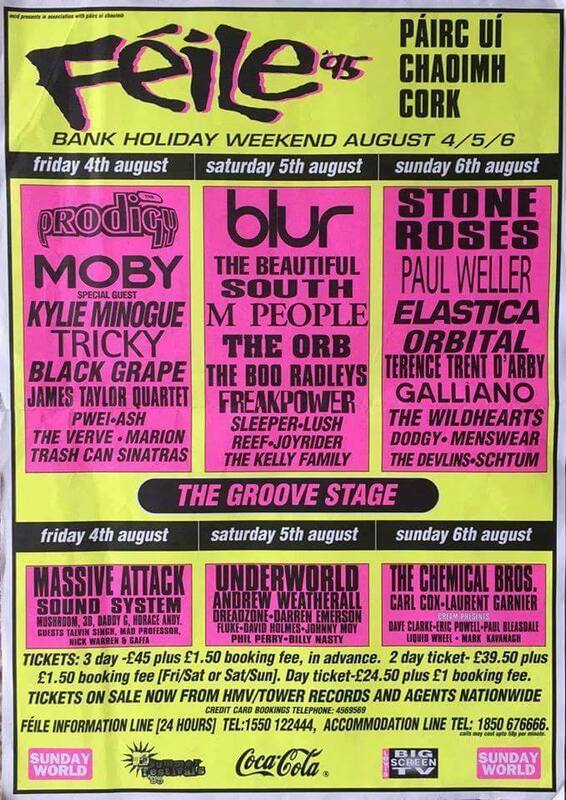 Moby, Kylie Minogue and the Stone Roses would all easily headline any festival today, in fact Orbital headlined the opening day of Forbidden Fruit this year with Underworld doing so last year. One of the most striking aspects of the Féile flyer is the helpline. There’s no nifty Facebook rollout or event pages or online hubs to get all your info. First of all, you have to be lucky enough for one of these flyers to somehow appear within your vicinity, be it on a telephone box, newspaper or over the radio and then remember the details if you don’t have a pen and paper, because unluckily camera phones still didn’t exist. That means then dialing up the number from a landline and then waiting impatiently for each option to be announced by the answering machine while it drives up your phone bill for that month. Alternatively, if you’re out and about you can pop into the nearest pay phone and hear all that Féile has to offer. To add to this, there was the accommodation helpline and if you’re looking to pay by credit card, you also had to call someone. Yes, that means you can’t take a picture of your order confirmation and glitter it with emojis for you Instagram or Snapchat stories. Obviously, given all the hassle it would be to call someone and read all your card details out to them, physical sales made up the majority of ticket sales, but if a weekend ticket is going for 45 pounds (that’s right pounds), a stroll down to HMV or Tower Records would be well worth it. Sadly, we tried to call the helpline to see what exactly the 1995 experience was all about but disappointingly and somewhat eerily, it has been replaced by a direct line to the North Pole’s main man, Santa. Calls to 1550 lines are 1.20 a minute and that might explain why Santa sounds like he’s answered the phone on a Sunday morning after two hard days on the rollover. To recreate Féile in 2017 would cost both promoters and punters a pretty penny, not only when it comes to booking the lineup and buying tickets but also trying to get through to the helpline to see what exactly is in store. 45 pounds for three days is definitely a steal, but the devil really is in the detail.